We may even call a debtor or debt by a different name, like: purchaser, borrower, defaulter, and mortgagor. When you are a debtor the person to whom you owe a debt is called a creditor. In most cases, if not all, the creditor has the upper hand over the debtor. Regardless of what you call it, these concepts are found in many places in the Bible and it seems they are never really a positive thing. Exodus 21:5–6 And if the servant shall plainly say, I love my master, my wife, and my children; I will not go out free: Then his master shall bring him unto the judges; he shall also bring him to the door, or unto the door post; and his master shall bore his ear through with an aul; and he shall serve him for ever. Leviticus 25:14–17 And if thou sell ought unto thy neighbour, or buyest ought of thy neighbour’s hand, ye shall not oppress one another: According to the number of years after the jubile thou shalt buy of thy neighbour, and according unto the number of years of the fruits he shall sell unto thee: According to the multitude of years thou shalt increase the price thereof, and according to the fewness of years thou shalt diminish the price of it: for according to the number of the years of the fruits doth he sell unto thee. Ye shall not therefore oppress one another; but thou shalt fear thy God: for I am the LORD your God. 2 Kings 4:6–7 And it came to pass, when the vessels were full, that she said unto her son, Bring me yet a vessel. And he said unto her, There is not a vessel more. And the oil stayed. Then she came and told the man of God. And he said, Go, sell the oil, and pay thy debt, and live thou and thy children of the rest. Luke 16:4–5 I am resolved what to do, that, when I am put out of the stewardship, they may receive me into their houses. So he called every one of his lord’s debtors unto him, and said unto the first, How much owest thou unto my lord? As humans our sin is a debt we cannot possibly repay, unless we die. Thankfully, Jesus offered Himself to pay that debt that He did not owe, because He had no sin (2 Corinthians 5:21; 1 Peter 2:22; 1 John 3:5). Though we cannot possibly ever repay that debt to Him (or to the Father who gave His only begotten Son), we can still be in debt to Him. Remember, Jesus paid our debt and bought us with the price of His life! In consideration of the possibility of Spiritual indebtedness, we should be always looking for ways to honor and glorify the Lord – “I beseech you therefore, brethren, by the mercies of God, that ye present your bodies a living sacrifice, holy, acceptable unto God, which is your reasonable service.” (Romans 12:1). 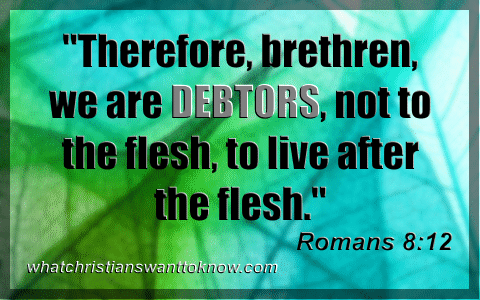 So, our Spiritual indebtedness is not literal, but figuratively when we choose to live in the flesh rather than walk in the Spirit we fall short and become a Spiritual debtor. We are reminded of our indebtedness in the Bible. Biblically speaking, a good practice is to “owe no man any thing, but to love one another: for he that loveth another hath fulfilled the law” (Romans 13:8). And as believers when we choose to walk in the flesh rather than in the Spirit we become a Spiritual Debtor because the least we can do for all He has done for us is to “… be ye transformed by the renewing of your mind, that ye may prove what is that good, and acceptable, and perfect, will of God.” (Romans 12:2). Don’t be a Spiritual Debtor, choose to mortify the flesh! Previous post: Why Don’t More Christians Share Their Faith? Next post: Should Christians Challenge The Teaching Of Church Pastors?